This pool room not only has a beautiful view of the outside, but it creates the ambiance of relaxing next to the Cambrian Sandstone Bluffs on the shores of the Wisconsin River. In fact, actual casts of the sandstone bluffs were created in order to help decorate this room. Besides the décor, you’re able to relax in the pool, hot tub, one of the many private group seating areas, and the best feature of the room…. the Indoor/Outdoor Swim-Up Bar! 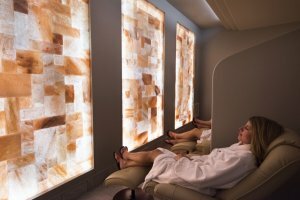 The Salt Treatment Room Therapy lets you relax in a room surrounded by Himalayan Sea Salt, where pink salt crystals coat the floors and the tile on the wall. While lounging and relaxing inside the room, microscopic salt particles are released in the air. This process is very healthy for your skin and clears your lungs to help you breath easier. Located on the second story of the new expansion, Nava offers delicious cuisine prepared by Sundara’s Master Chef! Fresh breakfast is served complimentary for overnight guest, and guests who visit just for a day appointment may enjoy the breakfast for an additional fee. 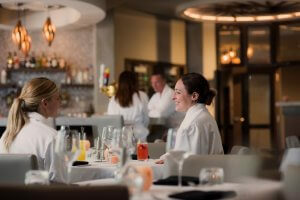 Eventually, Nava will host cooking demonstrations where you can learn to cook chef-inspired dishes. Attached to the dining room is a private board-room, which doubles as the spa’s wine cellar, where you can host your small meetings or group gathering. There are many places to lounge around and relax on the deck surrounding the outdoor pools. 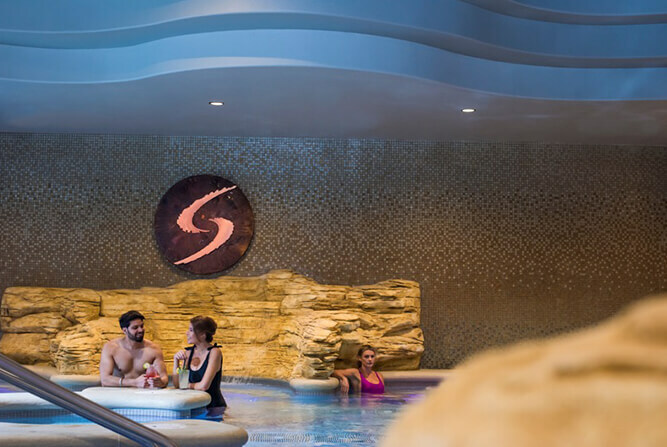 The saltwater pool features a giant Sundara logo “S” in the middle as well as shallow in-pool lounging chairs. 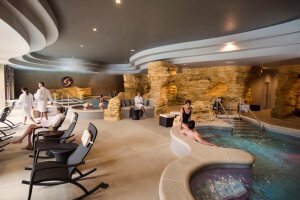 For a more indulging experience, the indoor/outdoor pool features a glass firepit running through the middle and it connects to the Swim-Up Bar inside the indoor Cambrian Oasis. While most of the expansion at Sundara is open, renovations are currently being completed on the existing space. Make your reservation today and Energize Your Soul!